She didn't bother resisting. Instead, she placed her hands on the side of his face and kissed him. The strong sun on her back, the open air of the hot summer only propelled her to kiss him harder. An inextricable sense of freedom had seized Tamar and she welcomed the freedom of her impulses. Faris, too shocked at first, stood lamely with his hands at his sides, and seconds later slipped his hands around her hips and did not let go. The characters in Aida Zilelian's breathtaking and heartbreaking first novel The Legacy of Lost Things operate within a world of convention and repressed desires. The Satamian and Yessayan families are both Armenian, but hail from very different parts of the world: Beirut and Bucharest respectively; lost idylls both. The Lebanese Civil War and the Ceaușescu regime conspire to land both families in Sunnyside, Queens, of all places, where they coexist uneasily side-by-side. These Armenians are a clannish bunch: Anoush and Bedros Satamian insist that their daughters marry an Armenian -- hence Tamar cannot wed her childhood love Faris, who is an Arab, and she marries the prosaic, if hard-working, Levon Yessayan instead. Through an unfortunate occurrence on the eve of their wedding night, Levon realizes that he is not his fiancé's true love. By an even stranger coincidence, Faris marries another Armenian Sariné and also settles in Queens. Then, as they say, all hell breaks loose. Or sort of. The two families who begrudgingly intermarry are at once conscious of their traditional ways, but unable to break free from them. As survivors of the Armenian Genocide, they have been brought up to trust only each other: Exogamy is a cardinal sin and cavorting with odars or "foreigners" -- as Americans are referred to -- is frowned upon. Once in Queens they settle down and have families, but transmit their trauma and longing onto their children, whom they more or less abuse psychologically and psychically. Araxie and Sophie live in constant fear of disappointing Tamar and Levon, and the latter also beats his wife when an uncontrollable sense of rage occasionally overpowers him. Then one day, Araxie, tired of the deceit and the palpable sense of sadness that overwhelms her family, disappears with her best friend Cécile. What ensues is a tragic and powerful tale of love and hate, tragedy and rebirth. Zilelian's prose is lyrical at times, but for the most part she crafts a purposely flat realism that perfectly complements her subject matter. Reading Legacy, one thinks of Donna Tartt's Pulitzer Prize-wining novel The Goldfinch. Perhaps it is the presence of abandoned children in both, perhaps it is the similarly despondent scenes set in a soulless Las Vegas that make one connect the two. But while's Tartt's prose is perhaps more erudite and recherché, there is something grittier in Zilelian's that makes one want to read on. At other times, the writing reminds one of Updike -- sociologically astute in its acute attention to detail. Here we learn about the small but fascinating enclave of the Romanian Armenians of Queens -- who knew? My one criticism of the novel is that Cécile, and to a certain extent Faris, receive somewhat short shrift -- but they are both outsiders, and so in a way this is perhaps not surprising. 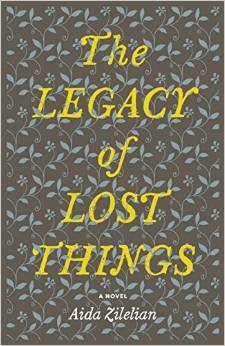 In the end, The Legacy of Lost Things is as much a cautionary tale about following one's bliss -- and one's heart -- as it a reminder that events long past can be repressed, tucked away, hidden under historical rocks and behind personal shadows, but never fully expunged. Araxie's great realization at the end of the novel, however, is to recall that human will can still overcome the darkest and most violent of pasts. We are born into circumstances that we sometimes resent or abhor. What we choose to do to change them however, Zilelian seems to say, is sometimes at least partly within our control.